Our world is part of a beautiful Universe that surrounds us. We live in a world of natural beauty, harmony and perfection, but unfortunately humanity is playing its part in destroying that beauty. We live a life that’s based on fear, anger, hate and the wish to bring harm to each others, all the while disregarding the many blessings that exist around us in our world. What is happening to us, does anybody really care? We live in a world of contradiction, contradiction that exists everywhere, in our continent, our country, our city, our neighborhood and even within ourselves. We enjoy making each other suffer, we enjoy seeing each other suffer, and all because it makes us feel better about ourselves in some ways because of all the fear, hate, anger, and jealousy that exists in our life. This is something we can all relate to on some level in our everyday life. In this article, I would like us all to take a look within ourselves, and take a moment to step aside from the world that surrounds us. You are not happy so you wish everyone around you unhappiness. You are not able to deal with your own issues so you feel jealous of others who have worked on themselves. You made some wrong decisions and wish that everyone around you did the same. You feel rage and anger towards anyone around you who seems to live happy and well rounded life. We all come into this life to learn about ourselves first, then to learn about other experiences. Each one of us has different things to learn with different experiences to go through. If you decided to become a doctor, then those are for your own reasons that mean something only to you. If you became a psychic, again you did so for your own reasons and those reasons means something to you alone. You became whatever you did for your own reasons that mean something to only you. So with that I am happy for you, and hope you are also happy for me, because in the end we are both here to acquire our experiences, to go through them and then learn about ourselves as individuals. Your Soul is the upper hand in your life because your experiences play a part in your Souls evolution. You accepted the challenges and the tasks that would take place of your life before you were even born. You agreed to live out this part of your evolution, so why you keep complaining? Why you keep blaming? What is it about yourself that you are so unhappy about? Life is a school where in areas we pass our tests and in others we fail. Regardless, you need to learn to keep moving and trying to improve upon ourselves. None of us are perfect, and if we were then what are we doing here? Some part of your experiences is your karma and other parts are just your lessons in this lifetime. You attract the people into your life that mirror something in you and you attract teachers who can help you enhance and attune your performance in this lifetime. Life is hard as you make it so stop complicating it! You are all trying to cope with your daily activities and trying to have less hardship and abuse inflicted upon you. I means, isn’t life hard enough without adding to it with the personal abuse you bring upon yourselves? Regardless of your position in life, whether you are a teacher, a coach, a master, a doctor or even a president, let me remind you kindly that you are still a human being. Unless you have the Soul of an ascended Master then you will have to go through some major and minor issues in your life. We are all here to progress and to learn how to deal with our own life, this is part of the responsibility that comes with being alive and there is no getting away from it. As I mentioned before, many people becoming jealous of others anytime they see someone trying to better themselves in any way and cope with their life in a positive way. This leads to negative thoughts and feelings toward others, and whether those thoughts and feelings are conscious or unconscious this leads to psychic attack being projected to those people. What is a psychic attack? Psychic attack is simply negative energy that someone sends with the conscious or unconscious intention to inflict harm upon you, your life or your family. Harm can be launched towards your emotional, physical, spiritual or mental state. Those negative energies can be projected in the form of thought, based mainly upon jealousy toward you. It can also happen for many reasons other than jealousy. 2- Your life is progressing forward while theirs is stagnant. 3- They are envious of your looks, your career, your wife or husband, your environment. 5- Lack of self conviction. If you consciously send negative energy toward someone else with the intention of inflicting harm, then what you send is exactly what you will attract upon yourself in your own life. The Universal Law of karma states that what goes around comes back around to you multiplied. What are the symptoms of a psychic attack? Here are some examples of what you can experience whilst under a psychic attack. 1- Dreaming very frightening nightmares. 2- Seeing your attacker in a devilish way, either in your dreams, your meditation or in your thoughts. 3- Feeling tired and depleted of energy constantly and for no reason. 4- Having pains in the same place at the same time on a regular basis. 5- Experiencing illness or pains in areas of weakness that your attacker is already aware of. 6- Lack of concentration and feelings of laziness when it comes to completing daily tasks. 7- Having unusually painful, even severe cases, headaches accompanied with vomiting or dizziness. 8- Questioning or doubting your direction in life, even after having been aware of your direction beforehand. 10. Having thoughts and images of your attacker creeping into your mind constantly. 11. Feeling that you are being watched and seeing shadows around you from the corner of your eye, even when you are alone. 12- The worst kind of psychic attack can inflict feelings of having a heart attack, and feelings of the desire to commit suicide. How to heal psychic attack? 1- Becoming aware of the psychic attack through identification of the unusual events that are taking place in your life will help to diminish the effect of the attack by 75%. 2- Ask your Spirit Guides and Guardian Angels to help you stop the attack and for protection, even if you do not know them or believe in them, asking them is enough, your faith is not required for them to do their work, although it helps. 3- DO NOT SEND similar energy or thoughts to your attacker. 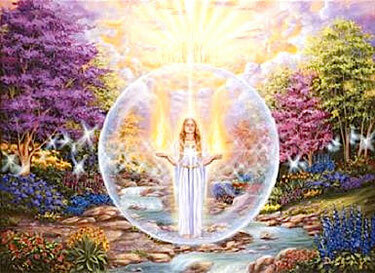 Send only the pure white energy of light directly from the Universe, the Source or from the GOD of your own belief. 4- Remember you attacker is the weaker one so instead of returning thoughts of anger, hate or fear to them try to feel compassion toward him or her and send them light, love and blessings to help them see and heal their own darkness. 5- Every time your attacker comes into your mind, imagine that you are showering them with the pure light of the Universe. Always change the way you send your light by imagining it being sent in different ways and always remember to keep your protection around you. 6. Work on yourself. The most important way of protecting yourself from the effect of psychic attack in the first place is to be emotionally strong and stable and do not allow others to identify with your fears because this reveals your weakness. Try to identify with your own emotional issues and fears and heal them, this way you are protecting yourself from being emotionally vulnerable, making you less likely to absorb the effects of the negative energies. Just mentioning these words makes some people cringe. What is a psychic attack? It is the assault upon your aura, without your conscious permission, by another person, place, thing or group. It will leave you feeling open, exposed, vulnerable and sometimes, a sense of danger and an anxiety or panic attack. I say 'conscious' because on a subconscious base within ourselves, we have fears--those things we haven't worked through or with, and have yet to integrated into ourselves. So long as they remain unintegrated, they expose us and leave us open, aurically speaking, to someone assaulting our aura and draining us of Prana, a life-giving energy. In my business as a shaman, I've been exposed to just about every kind of psychic attack, whether by an individual or a group. What I share with you here are my experiences. That is not to say I know everything, because I do not. Nor do I know all the different methodologies of protecting one's self, either. What I do know, is contained here in the article. So, let's get back to this fear thing. All the attacks I've experienced over the years were necessary in order to rid me of the one thing that could get me killed out there in non ordinary reality: FEAR. You can't be a working shaman and be afraid. At the root of any psychic attack upon any person, it is designed to "hot button" our fear. It could be fear of the unknown. Fear of being controlled by another person. Fear of being hurt. Fear of being killed. There are many fears out there, but the basic, underlying theme to why psychic attack works is because of our fear. Who is Doing the Psychic Attacking? Usually, a person doesn't even know they are attacking you. This is the unconscious kind of psychic attack. And then, there's those who do it on purpose and consciously. In either situation, you can confront them and tell them that they are draining you of energy and to stop it at once. Often, in dysfunctional family dynamics, we see prana-guzzling from a parent to a child or vice-versa. This is where pieces get taken from everyone involved in this psychic dance of unhealthy patterns. It can be a co-worker where you have your job. Or your boss. It could be the type of job you're in, such as a nurse in a hospital, a police person, a firefighter or any activity where there's high drama linked with life-death situations. Or, its someone who doesn't like you--and you may or may not know it. Many of us are sensitive to being disliked. I think we'd all like to think we're liked by everyone--but that's not the reality of the world and how it operates. Inevitably, we all make enemies by simply being alive and breathing. It's not that we have to do something terribly wrong to earn them, either. Some of us, more than others, accrue more enemies. And not everyone is going to be overjoyed over our decision making process, either. Just by standing your ground and staying in your own, personal balance, can make people angry at you. You can be attacked just because you're breathing. The key here is: don't take it personally. Cop an attitude that you know not everyone is going to agree with you. If you can shift yourself into detaching (Zen-like) emotionally from those who don't like you (and never will), then you are stopping the giving or frittering away your energy to them. You can literally, bleed yourself dry over an issue, person, circumstance--and you're hemorrhaging yourself! They aren't doing it for you--you are shooting yourself, quite literally, into your own foot! Most of us do this--usually when we're younger and less often as we mature. And over time and years, we "get it" and stop it and rise above these situations so we don't take a pound of our own flesh. It's easy to say: well, get rid of your fear and you can't be attacked. Most of us spend a lifetime working through our fears and releasing them. And even if we do--we can still get attacked! You can lower your fear barrier or even expunge it from yourself forever, but that doesn't mean you won't or can't be attacked by a person or group. And when or if this happens, it won't knock you over--unless it's a group after you, and then, you're probably going to have to call in some help. But more on that later. Tiredness. Fatigue. Because an individual or group is putting an invisible "gasoline hose" into your aura and pumping out your pranic energy, you are going to have less available to you than before. Without prana, there is no energy available. If you suddenly become very tired, even weak feeling when you're with a particular person, in a particular room or place, this is a sign that you're being drained of pranic energy from your aura. Tiredness or a feeling of absolute weakness or fatigue that occurs at a certain time of the day, almost like clockwork. I know people who routinely have a schedule for tapping into other person's aura at a specific time of the day or night. Generally speaking, we all get a little lackluster between 2pm and 4pm every day--this is known in biology as the "post prandial dip" and it is a metabolism phenomena associated with all human beings. We all do this, every day, almost without exception. This is NOT psychic attack. If your cyclic or periodical tiredness suddenly avalanches you at any other time other than the above, then a psychic attack may be occurring. Drained feeling. You can spend five minutes with this predator and walk away on weak knees and feel as if you are going to have to crawl to your car or home. You can barely walk upright. When this happens, it usually takes a couple of hours or a good night's sleep, to recover from it. Nightmares. If you usually don't have nightmares and suddenly, you begin to have some of whatever you fear chasing you and trying to kill you, this could be an attack. But you need to be sure about this, because there could be another reason for it occurring. From time to time, our subconscious wants to get our attention about our Shadow material that we're not integrating into ourselves and it is emotions that remain in a suppression/repression or denial form, and it will start sending us "shadow" dreams. Shadow dreams are always chase dreams where you're being chased and attack by either a known or unknown entity. The one thing you know in this dream is that if you let him/it/her catch you, you're dead. So, in these dreams, you are constantly dodging, ducking, running and hiding. You need to ask yourself what is presently going on in your life that you're not facing. You need to assess which of these two things are going on in your life. Most nightmares are NOT about psychic attack. A clenched knot feeling in your stomach/solar plexus area. If you walk into someplace and your solar plexus snaps shut when a particular person approaches you; beware. You are being given warning that this person is dangerous to you. Our solar plexus is the seat of our fears/anxieties/repression and suppression. It is where our Shadow contents reside. When you get this gut-clench feeling, play head's up football, pay attention and stay alert. If you feel suddenly weak or shaky, get away from this person or activity. Anxiety and Panic Attacks. Many times, we get drained and siphoned from and don't even realize it until much later. The reaction then becomes an anxiety reaction or sometimes, a full blown panic attack because on a subconscious level, you are reacting to the assault like any normal person would. If you have such a symptom, then think back several hours or 1-2 days before and carefully go over who you met, where you were at and try to pinpoint the possible psychic attack. Depression. Long term psychic attacks by an individual or group that does this cyclically for weeks or months on end, can end up making you feel morose, sad, hopeless, listless and like life isn't worth living at all. This is a serious attack and will need serious help in the form of a shaman to catalyze the break-up of energy and disconnecting the lines from your aura. Afterward, your "old jaunty self" will return. Suicidal. Long term psychic attack can literally drain a person of so much pranic energy that all they thinking or know is that they are dying--because they are dying a little each day. It's no wonder the person becomes suicidal or has thoughts of leaving--because they are dying an inch at a time through the machinations of another or others. When a lot of your pranic energy is sucked out of you continually, death can occur. That, or your health is wrecked. Loss of Confidence. If you were once a fairly confident individual, but over weeks or months of time, it is eroded way from you until you feel like a scared, vulnerable little rabbit out there in the Big, Bad World, then someone may, indeed, be chipping away at you--psychically. Victim Mentality. A person gets into this state when they were never in one....but over a period of weeks or months during a long-term psychic attack--they begin to feel hopeless and helpless. They can literally "freeze", like a deer in headlights, and cannot help themselves out of this inner immobility. Many times, this person must 'hit bottom' on this and what will save them is themselves when they get angry enough to fight back. The anger, used in a positive sense here, snaps and breaks the lines between yourself and the psychic attacker. Health problems. A specific organ of the body is chosen and energy is sent in, like a sledge hammer, to shut it (and the chakra) down once and for all. Usually, if the person or group mean business (to kill you), they target your heart to create a heart attack. If it doesn't work, and you're getting protection, it may end up as lung congestion, bronchitis, or pneumonia. It can also be any organ in the body. If it was working fine and you suddenly get assaultive pain with it, on and off, for "no reason", then you need to see your doctor. If the doc gives you a bill of good health, then think about being under psychic attack. It has been mine, and many other shaman's experiences that when a person comes to us and tells us they've been under attack for years or decades, that what we're really dealing with is a person who is potentially schizophrenic or who has suffered a chronic psychotic break from reality. They are right: they are under attack. Usually by the "garbage levels" of the astral plane. What they see and hear is real. If this individual does not get psychotherapy, SR/E and homeopathic treatment, they probably will never resolve this issue this lifetime. At least, that is my observation and experience. These people, bless them, have spent a lot of money and time on many different healers, psychics and shamans trying to get help--but in the end, it all fails. No one can help them--at least, not on the clairvoyant end of the stick. This requires some hard reality work coupled with energy medicine. And even then, it may not be enough. My experience is that these individuals are taking on such a lifetime to learn something from it and its not to be changed or altered from what it is. All of us, myself included, have fears. There isn't any among us who don't. The only question is: Is the fear running you/your life, or not? If it is, then you are open to psychic attack. You need to list your fears. Don't be shy about this. Look at what you fear. And ask yourself why do you fear it? Many times, our fears are based upon our childhood, or a particular experience, or a parent who had a lot of fears that they passed onto us. Fear leaves us open to be plucked like a ripe watermelon by those individuals who just delight in sucking us dry of our prana, our right to live and to exist. We have no one to blame but ourselves. After all, it is OUR fear--not there's--that leaves us open and feeling vulnerable. They're just being opportunists, is all. * Psychotherapy. A good therapist is worth their weight in gold. If you have the money, this is a good avenue to explore because most of our fears are childhood-based. * Constitutional homeopathic treatment. I have seen people frozen by irrational fears completely lose them when the correct remedy was given to them. A homeopathic remedy can break off and stop a psychic attack by a person or group. * Soul Recovery and Extraction. If you have lost pieces of yourself, then there are "holes" in your aura as a result. These holes like to be filled with astral garbage that does nothing but make our life hell, fill our dreams with terror, and make us feel anxious or panicked. A facilitator can bring back those pieces and you can integrate them. When these 'holes' are filled, you will no longer be open or vulnerable to attacks. 1. Saranwrap. I know, most people take a second look at this, but I mean it. Whenever I go on the road and have to give seminars or talks, I always pack my trusty Saranwrap! It is three sheets or layers, one on top of the other. I tuck it beneath my bra so that it hangs over and covers my solar plexus (the area just below where your breastbone or sternum ends to your tummy button). If I get into a seminar where I feel instant draining, and I don't have time to do anything about it because my attention is too scattered and pulled and I can't focus like I need to, then I excuse myself and go slap on my Saranwrap and there's a happy ending. The only bad thing about this is: you'll sweat like a pig beneath it. Bummer. 2. Ask your Spirit Guide for protection. I know this sounds so simple and logical. And it is. But you know what? How many of us forget to ask? I do this all the time. And then I could kick myself. When I do remember it, I simply ask my spirit guides to "let there be a positive and reciprocal energy between me and everyone." 3. Black Tourmaline taped to your solar plexus. Yup, this works wonders. Seen it in action many times and I've used it myself upon occasion. Black Tourmaline is one of the top gemstones for protection against psychic attack. By taping it right on your stomach region with a piece of tape, it will send the energy right back at the sender and leave you alone. This stops fear/anxiety/panic instantly. It works wonders. I have had people, who have been psychically attacked in the dream state put a couple of Black Tourmaline in their pillow case where they lay their head while the sleep--and no more nightmares or bad dreams. You can also do this a little less obviously and wear black tourmaline on your LEFT side. The left is where the assault comes into your aura. 4. Jasper, Agate and Turquoise. These are three other gemstones that are used continually by Native Americans during ceremonies to protect themselves. When we work in ceremony, we're wide open, so to speak. We may wear a necklace of one of these stones, or place one of them into our LEFT pocket. 5. Visualizing white or gold light around you. If you have time, focus and intensity of thought, you can close your eyes and see this ball of white/gold light hovering over your head and then spilling down in an egg shape all around you. Make SURE you visualize the color coming beneath your feet and sealing up. If you make the mistake of not including the soles of your feet, you're still wide open for attack. 6. Prayer. This is very simple, but very effective. Ask for help from those that you believe in. In asking, you are changing the dynamic. And pray with focus and intent. 7. Flower and gem essences. Some are very protective. If you are having nightmares, then Crested Prickle Poppy is what you want to consider. If you are in a highly stressful environment, then consider Black Tourmaline. By ingesting it, it is just like taping on a small pieces of the stone to your solar plexus/stomach region! 8. Yoga exercises. Correct breathing and the postures assumed in yoga actually stimulate and clean out your chakras. By simply doing this, you are ahead of the game. If your chakras are up and working, that is a powerful protection in the first place. I've had this done to me more times than I care to remember. And at those times, I asked for help--not only from my spirit guides, but I dug into my own nest of fears and began to work on my own dirt. I also asked for help from my friends, other shamanic facilitators, whom I trusted and knew could protect me. Group assaults are usually about power struggles; one party envies, is jealous of, power over you, or wants to get even with, another party. Most people will not have to experience this, but if you're a shaman or working heavily in the metaphysical areas, then its more likely to occur. The key is to know what to do about it and once you realize what is happening, call in the troops from both sides of the tracks! The key to what I've learned from all these dumb, stupid attacks by others is that I must force myself to rise above and move into a state of complete, pure compassion toward them. When I do this sincerely, and on an emotional level and send pure love to them, they can't stand it and they stop the attack. They've certainly been great teachers. But I didn't do this alone: I had help from the Other Side from my spirit guides, and from friends and family on this side, too. It was a team effort. When you get in trouble: you ask--a lot. Love is the greatest healer and your greatest protector against psychic attack. A love of yourself, first. You must love yourself, warts and all. No one's perfect; none of us ever will be in this human body. Learning to accept yourself for what you are and are not is the first, big step in this process. Eventually, with time, trials and experience, you will understand the term, "active compassion" and be able to apply it to others and groups. It gives you the emotiona detachment necessary. I have found that loving one's enemy is the finest choice one can make. They might send you destructive energy, but when it meets the energy of love; it completely dissipates it. Hate cannot destroy love; just the opposite. Then, identifying your fears and understanding them in the context of you much more than you did before, is another step of progress on this ladder of selfhood. Black tourmaline is said to protect from all kinds of negativity, ranging from electronic radiation from TVs and computers, to negative people, psychic attacks, past lives and spells. Black tourmaline seems to bring grounding in your life, and to balance our bodily systems for health. Tourmaline has been uses as a gem for over 2,000 years. In physical terms, tourmaline is a borosilicate mineral of complex and variable composition. Tourmaline is the name given to the group of related minerals that all have essentially the same crystal structure, but that vary significantly in chemical composition and in some of their physical properties. Another name for tourmaline is ‘schorl’. Tourmaline can be found in many countries such as the US, Brazil, Burma and Zimbabwe. What is chemically special about tourmaline is that when it is heated, it obtains an electric charge. When charged, it attracts small objects such as hair or small pieces of paper. It is this unique property that has resulted in scientific and industrial uses of tourmaline. Black tourmaline has strong protective properties, and can offer shielding from harmful emissions from electronic equipment, from psychic attack and it is said to protect from magic spells and curses in present and past lives. Tourmaline has been considered to heal physical and mental disorders as well as prevent death. It already was attributed such qualities back in the Middle Ages. Black tourmaline has been known for its strong balancing properties to realize physical healing and health. It is said to aid a number of body systems, including the endocrine, immune and autonomic nervous systems. How does the black tourmaline work? It help your body towards homeostasis – the state when your body is working perfectly and everything is in balance. This mineral is considered to be an effective pain reliever, and can be used in the treatment of arthritis and back disorders. For mental/emotional healing, tourmaline appears to help enhance concentration, inspiration and sensitivity. Further, it has been used to stimulate a proper balance between the left and right sides of the brain. Black tourmaline is considered to also help in all kinds of other areas of our lives where a state of equilibrium is required, such as between play & work, ease & pain; or, inner- & outer- consciousnesses. One of my sources referred to people in the healing profession specifically, stating that black tourmaline can be useful in balancing the healing and creativity energies required in the art of healing. As its strong back color indicates, black tourmaline is mostly associated with the root or base chakra. As such, it can be used to gain grounding. For example, in your healing practice, you can give your clients a black tourmaline stone to hold for a few minutes after their healing treatment, as tourmaline is said to rapidly dispels any ‘spacey’ feelings post treatment. You can, of course, also use it yourself, after your meditation, or early in the morning, to quickly wake up. Having said this, black tourmaline seems to absorb and dissipate negativity related the other chakras as well. It is said to dispel a negative frame of mind (3rd eye chakra); dissolve negative emotions (heart chakra); and to help being free from irrational fear and panic (solar plexus chakra). I have read that rubbing black tourmaline brings luck and happiness. When rubbed, it becomes charged with magnetic electricity and the luck intensifies. So, let's get back to this fear thing. All the attacks I've experienced over the years were necessary in order to rid me of the one thing that could get me killed out there in non ordinary reality: FEAR. You can't be a working shaman and be afraid.At the root of any psychic attack upon any person, it is designed to "hot button" our fear. It could be fear of the unknown. Fear of being controlled by another person. Fear of being hurt. Fear of being killed. There are many fears out there, but the basic, underlying theme to why psychic attack works is because of our fear. Who is Doing the Psychic Attacking? Usually, a person doesn't even know they are attacking you. This is the unconscious kind of psychic attack. And then, there's those who do it on purpose and consciously. In either situation, you can confront them and tell them that they are draining you of energy and to stop it at once. It can be a co-worker where you have your job. Or your boss. It could be the type of job you're in, such as a nurse in a hospital, a police person, a firefighter or any activity where there's high drama linked with life-death situations. Or, its someone who doesn't like you--and you may or may not know it. Many of us are sensitive to being disliked. I think we'd all like to think we're liked by everyone--but that's not the reality of the world and how it operates. Inevitably, we all make enemies by simply being alive and breathing. It's not that we have to do something terribly wrong to earn them, either. Some of us, more than others, accrue more enemies. And not everyone is going to be overjoyed over our decision making process, either. Just by standing your ground and staying in your own, personal balance, can make people angry at you. You can be attacked just because you're breathing. The key here is: don't take it personally. It's easy to say: well, get rid of your fear and you can't be attacked. Most of us spend a lifetime working through our fears and releasing them. And even if we do--we can still get attacked! You can lower your fear barrier or even expunge it from yourself forever, but that doesn't mean you won't or can't be attacked by a person or group. And when or if this happens, it won't knock you over--unless it's a group after you, and then, you're probably going to have to call in some help. But more on that later. Shadow dreams are always chase dreams where you're being chased and attack by either a known or unknown entity. The one thing you know in this dream is that if you let him/it/her catch you, you're dead. So, in these dreams, you are constantly dodging, ducking, running and hiding. You need to ask yourself what is presently going on in your life that you're not facing.You need to assess which of these two things are going on in your life. Most nightmares are NOT about psychic attack. Psychotherapy. A good therapist is worth their weight in gold. If you have the money, this is a good avenue to explore because most of our fears are childhood-based. Constitutional homeopathic treatment. I have seen people frozen by irrational fears completely lose them when the correct remedy was given to them. A homeopathic remedy can break off and stop a psychic attack by a person or group. Soul Recovery and Extraction. If you have lost pieces of yourself, then there are "holes" in your aura as a result. These holes like to be filled with astral garbage that does nothing but make our life hell, fill our dreams with terror, and make us feel anxious or panicked. A facilitator can bring back those pieces and you can integrate them. When these 'holes' are filled, you will no longer be open or vulnerable to attacks. Saranwrap. I know, most people take a second look at this, but I mean it. Whenever I go on the road and have to give seminars or talks, I always pack my trusty Saranwrap! It is three sheets or layers, one on top of the other. I tuck it beneath my bra so that it hangs over and covers my solar plexus (the area just below where your breastbone or sternum ends to your tummy button). Ask your Spirit Guide for protection. I know this sounds so simple and logical. And it is. But you know what? How many of us forget to ask? I do this all the time. And then I could kick myself. When I do remember it, I simply ask my spirit guides to "let there be a positive and reciprocal energy between me and everyone." Black Tourmaline taped to your solar plexus. Yup, this works wonders. Seen it in action many times and I've used it myself upon occasion. Black Tourmaline is one of the top gemstones for protection against psychic attack. By taping it right on your stomach region with a piece of tape, it will send the energy right back at the sender and leave you alone. This stops fear/anxiety/panic instantly. It works wonders. I have had people, who have been psychically attacked in the dream state put a couple of Black Tourmaline in their pillow case where they lay their head while the sleep--and no more nightmares or bad dreams. Jasper, Agate and Turquoise. These are three other gemstones that are used continually by Native Americans during ceremonies to protect themselves. When we work in ceremony, we're wide open, so to speak. We may wear a necklace of one of these stones, or place one of them into our LEFT pocket. Visualizing white or gold light around you. If you have time, focus and intensity of thought, you can close your eyes and see this ball of white/gold light hovering over your head and then spilling down in an egg shape all around you. Make SURE you visualize the color coming beneath your feet and sealing up. If you make the mistake of not including the soles of your feet, you're still wide open for attack. Prayer. This is very simple, but very effective. Ask for help from those that you believe in. In asking, you are changing the dynamic. And pray with focus and intent. Flower and gem essences. Some are very protective. If you are having nightmares, then Crested Prickle Poppy is what you want to consider. If you are in a highly stressful environment, then consider Black Tourmaline. By ingesting it, it is just like taping on a small pieces of the stone to your solar plexus/stomach region! Yoga exercises. Correct breathing and the postures assumed in yoga actually stimulate and clean out your chakras. By simply doing this, you are ahead of the game. If your chakras are up and working, that is a powerful protection in the first place.